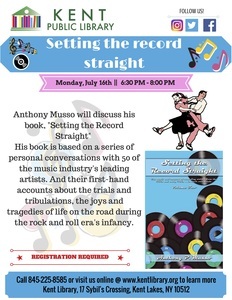 Anthony Musso returns Monday, July 16 at 6:30 to discuss his book, a series of personal conversations with 50 of the music industry’s leading artists about life on the road during the rock ‘n’ roll era’s infancy. Despite having become household names during their careers, the biographies of some of the music industry's biggest names are clouded with inaccuracies. While a number of the skewed reports might have developed innocently, the only way to correct the discrepancies was to gather information directly from each artist or founding group member. Hear little-known first-hand accounts about the trials and tribulations, joys and tragedies in the lives of great artists. Registration is required. The Kent Library is located 17 Sybils Crossing and can be reached at 225-8585 or www.kentlibrary.org.